Notes: Percentages reflect the median percent change for each group of states for each year. FY 2017 growth reflects projections in enacted budgets. In FY 2016, Alaska and Montana moved and in FY 2017, Louisiana moved to the expansion state group. Data Source: Enrollment growth for FY 2015-2016 is based on KCMU analysis of CMS, Medicaid & CHIP Monthly Applications, Eligibility Determinations, and Enrollment Reports, accessed October 2016. The spending growth rate for FY 2015 is derived from KCMU Analysis of CMS Form 64 Data. 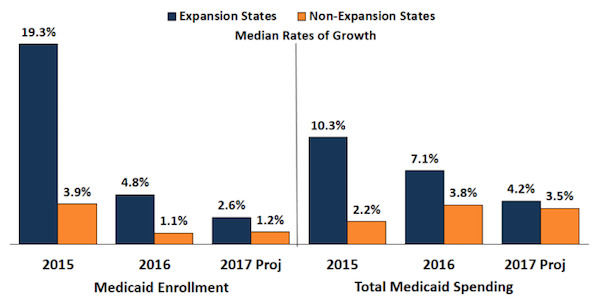 All other growth rates are from the KCMU survey of Medicaid officials in 50 states and DC conducted by Health Management Associates, October 2016. This entry was posted in Data Watch on October 19, 2016 by Genevra Pittman.